(North Africa- Tunisia- Libya- Algeria - Sardegna- Sicily- Italia- Italy- Sicily- Sardinia- Tunis- Medittanean islands- Africaum Pelagus). Issued Basel, 1576 by Henri Petri for. Pomponii Melae de Orbis Situ. 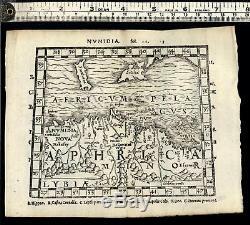 Charming and quite rare 16th century miniature wood-block engraved map. Depicts in erroneous and fantasy detail the northern regions of northern Africa, mountainous terrain shown as chains. Of genuine intense interest to collectors of Italian interest. The curious relationship shown between the islands of Sardegna & Sicily is worthy of note- Sardinia is shown as directly due west of Sicily, when in fact it is not this way. This interesting erroneous early cartographic relationship appearing on but a handful of maps. In nice, mostly clean condition, tiny old stain dot near centerfold middle whih blends in, overall a pleasing looking example, any age flaws visually trivial. 7 1/4" W x 6 " H.
6" W x 4 3/4" H. We do not sell modern reprints. 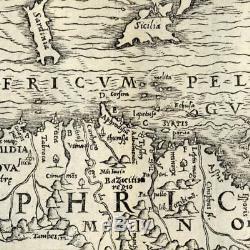 The item "Italia Italy Sardegna Sicily Sicilia North Africa 1576 Petri rare old map" is in sale since Wednesday, February 14, 2018. This item is in the category "Antiques\Maps, Atlases & Globes\Africa Maps". The seller is "oldmapsoldbooks" and is located in Dover.